Set up your aquarium and stand. Use aquarium soil as the base, slope up towards the back of the tank. Soil must be Aquatic as other soil may contain fertilisers or other chemicals harmful to your fish. Add a high quality, mineral-rich substrate on the top (this is the foundation for long-term success). This could be Tetra complete substrate aquarium fertiliser or Betta Choice aquatic soil. if you don’t like to see the layers of substrate this would be a good time to prevent that by leaving an inch or two of space between the substrate and the edges of the aquarium. Make sure you rinse plant substrate well before placing in aquarium. This is a good time to position the decor e.g driftwood or rocks while thinking about how the plants will be positioned. Once you are happy with the design you can start adding substrate on the top to decorate, fine gravel or sand would be a good choice, now you can start adding plants, try placing them where you think they would look good and move them around before pushing them into the substrate. When filling the aquarium be careful not to disturb the substrate or decor as once it is mixed it is very hard to separate again. There are multiple ways to stop this, one way is to use a dish and direct the flow towards it, another is to use a large plastic bag and cover the bottom, then slowly trickle the water onto it, as the water level rises so will the bag. The standard fluorescent T8 tube included with an aquarium hood or strip light is not ideal for healthy plant growth, whereas fluorescent T5’s can be used to keep easy plants such as cryptocoryne. Carpeting plants generally won’t survive with this lighting, stem plants can also be tricky keeping with these lights. Replace the supplied fluorescent lamp with a plant lamp (use two LED strip lights if you are keeping plants with higher light requirements). Try not to go overboard with light; don’t presume that the more light the more growth. Excessive light is likely to cause algae problems. Slowly increase the intensity of the lighting to reduce the chance of plants melting. Filter – Make sure that you have a good filter with an adequate flow (At least 10-15 times the tank volume per hour) and also make sure that the output of the filter that flows back into the tank is allowed to flow unrestricted so as to create good circulation in the tank. This helps disperse nutrients uniformly amongst the plants and prevents stagnant areas where plants do not receive nutrients and hence begin to die off giving rise to algae. Also, note that a lot of planted tank folks do not use activated charcoal in their filters as it might pull out some of the nutrients from the water. If possible, try getting your filter foam/bio-media pre-cycled by using it in an established tank for a couple of weeks prior to setting it up in the new tank. Use short plants in the foreground and add plants in ascending order to fill the midground and background. Research the plants you’re going to use as often aquatic plants are not fully aquatic or not aquatic at all & will not survive for long in your aquarium. A school of 6 to 12 small fish is perfect for natural aquariums. Remember, the plants are the “stars” of a natural aquarium. After setting up your tank give it a week or two to see how it is behaving and if the plants have settled down and have started growing. Also, make sure that your water parameters are fine. If this is the case and ONLY if you have also planted very heavily, then you can go ahead and add a couple of algae eaters into your tank. Algae eaters go a long way in keeping your tank spotless and algae free, more-so in such a tank where algae growth, if any, will be very slow and the fish will be able to keep up with it. Otos are regarded as one of the best algae eating fish out there although there are other fish/inverts you could pick too (eg: SAE, shrimps). 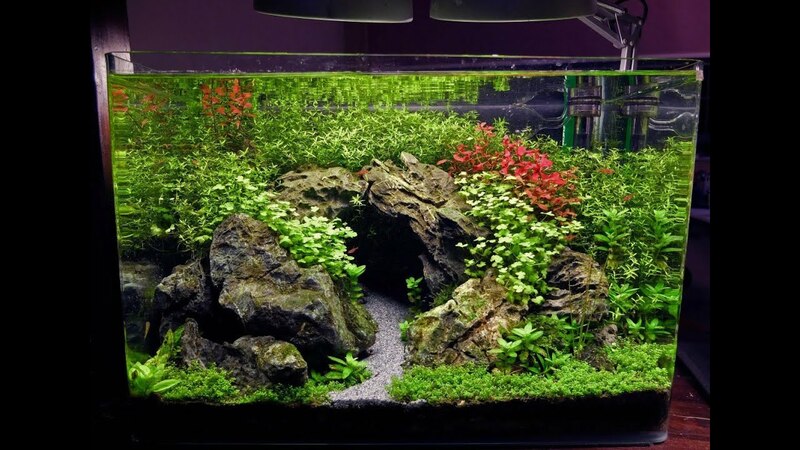 Some might argue at the idea of adding fish to an “uncycled” tank, but the truth of the matter is that if you have a heavily planted tank in which the plants are healthy and growing, the plants will effectively cycle the tank by immediately consuming any ammonia that is introduced into the system. After 2-3 more weeks if everything is going well and your plants are growing and look healthy you can go ahead and add the rest of your fish. It would be a good idea to add in small numbers over a couple of weeks although many folks have added the entire bioload in one go and haven’t had any trouble. Make sure the fish you choose are compatible with each other, so your research and speak to your local fish store before purchasing. As aquatic plants begin to develop, they will require supplementary nutrients (fertilisation) to sustain growth. Carbon is an especially important plant nutrient rapidly used by growing plants. Carefully follow manufacturer’s recommendations to maintain healthy plant growth. 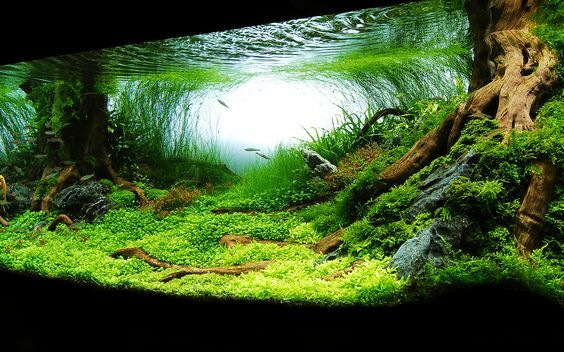 Carpeting plants like Java Moss, Willow Moss, and Water Wisteria tend to stay low to the ground and spread horizontally across the floor of your aquarium. Because of this, they make a great foreground plant. These plants are also excellent for water quality, since they tend to grow very quickly, and thus filter lots of water. DWARF BABY TEARS – These are my most favourite carpeting plant. It’s tough, hard-working, and a healthy carpet of DBT looks beautiful in many of the common aquascaping styles. As a bonus, if they’re producing oxygen, Dwarf Baby Tears have beautiful little bubbles that form on their leaves. DWARF HAIRGRASS – The aquascaping possibilities are endless with this type of plant. It looks beautiful next to Stone, as well as contrasting perfectly with dark sand or soil. It’s incredibly easy to grow. So much so that you’ll probably find yourself trimming this quite a bit! MARSILEA MINUTA – the aqua escaping possibilities are endless with this type of plant. It looks beautiful next to Stone, as well as contrasting perfectly with dark sand or soil. AMAZON SWORD – The Amazon Sword is the staple of most aquascapes. It’s easy to maintain, fast-growing, and can be quite beautiful when arranged in the appropriate area. Note that these can grow quite big (up to 20 inches), so they’re most often planted in the mid-background area. JAVA FERN – Java Fern is very a very low maintenance plant, and has a unique look that appeals to most aquascapers. Its biggest benefit is its ability to be planted in nearly any area of the aquarium without distracting from the hardscape. It also looks quite good! ANUBIAS NANA – Anubias Nana is one of the more appealing midground plants you’ll find in aquascaping. It tolerates nearly any water quality or environment. PYGMY CHAIN SWORD – This plant isn’t often seen in aquascaping. Mostly because it’s very similar to what we see everyday of our lives—grass. It’s useful for placement around hardscapes and is beautiful when properly trimmed. However, it’s nearly impossible to accidentally kill it! POGOSTEMON HELFERI – Besides having an interesting name, this is one of the most unique foreground plants available to aquascapers today. It has a striking zig-zag shape in its leaves and grows in a ‘blooming’ pattern that’s visually appealing in front of hardscapes. DWARF SAGITTARIA – Dwarf Saggitaria is an easily-maintained plant that maxes out at around 4-6 inches, making it perfect for midground aquascapes. Placing Dwarf Saggitaria around stonework or driftwood is an ideal location, giving it a perfect place to root into the wood or stone, and is an ideal complement. If you’re a beginner don’t try to use Hemianthus callitrichoides “dwarf baby tears” or POGOSTEMON HELFERI “downoi”. These not beginner plants at all. If you are a beginner and not very good with plants in general, stick with ferns, moss, and anubias, and never bury them. Instead, tie them to rocks or wood.